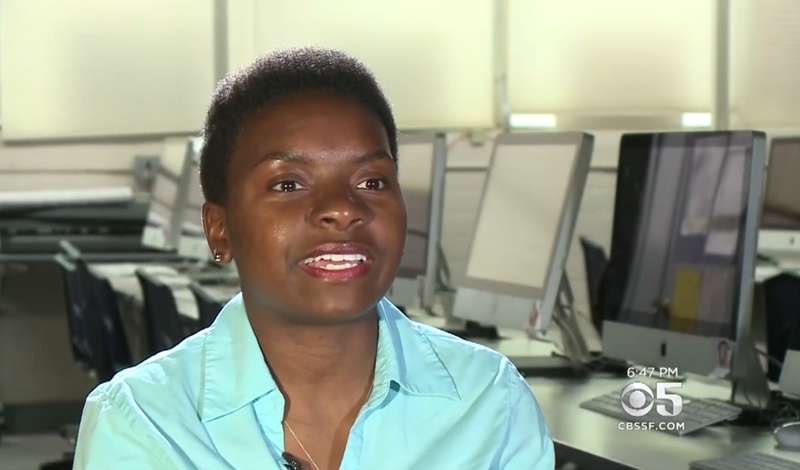 Elexis Webster is a 17-year-old high school junior for whom a GPA above 4.0 is considered the norm. But Elexis acknowledges that from the outside looking in, "many wouldn't expect me to have such a rough life," as she wrote in her application to Student Rising Above, a comprehensive year-round program that provides college-readiness support, tutoring, mentoring, paid summer internships and other assistance to high school students overcoming the odds of poverty, homelessness and neglect. “I grew up on the streets with an abusive drug addict for a mother, along with an older brother who molested me countless times, plus constant sickness," she wrote. "My life wasn’t a life, it was a war zone." KPIX 5 reports that Elexis grew up with her family living on the streets, in a dugout, a car, a motel and just about anywhere else they could find shelter. She was subject to constant abuse and recalls times when she and her sister were left alone for days without food. Because of her living conditions, her immune system became highly compromised and she was often sick in bed, missing school for weeks at a time. At age 9, Elexis was rushed to the hospital because her oxygen levels were so low, she almost died. When Elexis was 14, things started to change. Police discovered her and her sister in a car during the middle of a school day and arrested her mother. The two sisters were placed in a foster home with a woman Elexis now calls "Mema." Mema was Elexis' first and only foster parent, and she has lived with her for almost four years now. Elexis acknowledged that at first she viewed foster care in a negative way, but Mema soon changed that. With Mema's help and guidance, Elexis returned to school. When she became concerned that she wouldn't be able to keep up with students her age after being out of school for three years while homeless, Mema stepped in with some wise words of encouragement. Elexis was able to do that and became motivated to keep her GPA high in order to get into a great college or university. And for the first time, she can honestly say, "Life is great." “I see success, I see happiness and I see peace," Elexis told the news station.